(2) 20-watt recessed eyeball lights direct light onto merchandise you'd like showcased! Plunger lock keeps jewelry and other showcase items safe! Tempered glass construction is safer & stronger than traditional glass! 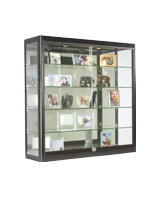 This jewelry showcase allows you to display your most stunning pieces of jewelry in style. 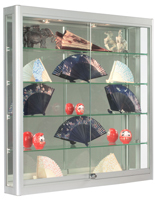 The showcase is an extra deep display, ideal for jewelry neck forms or other larger pieces. 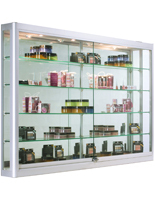 This wall-mount display case, jewelry showcase is perfect for freeing up floor space within your jewelry store or other commercial location. 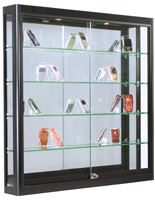 Floor-standing showcase displays can easily begin to overrun your store. Instead of hanging expensive artwork on your walls, why not utilize the space to sell more products? 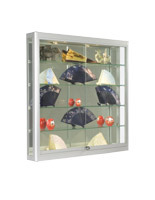 This jewelry showcase will affix to a wall with two heavy-duty z-bar mounts. 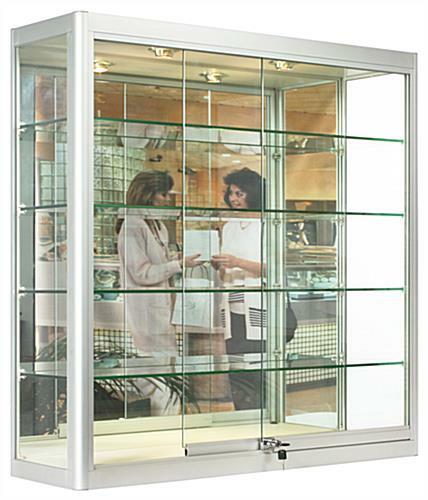 Hang one of these jewelry showcases to encourage the free flow of foot traffic throughout your store. 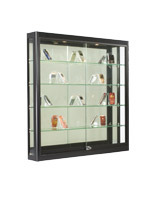 This jewelry showcase has many great features, making it a steal at this price! The showcase features two recessed eyeball-style halogen top lights. These can be tilted to direct light towards the front or back of the jewelry showcase. An on/off switch is located in the inner right-hand corner of the case for easy lighting changes. A mirrored back further illuminates jewelry and other merchandise. The case features four fully adjustable, rubber cushioned shelves to accommodate products of varying heights. Unlike most traditional 6" deep wall showcase units, this jewelry showcase is double the depth, at 12" deep! 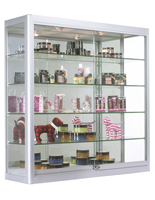 Sliding, locking doors prevent unauthorized access to the jewelry showcase. 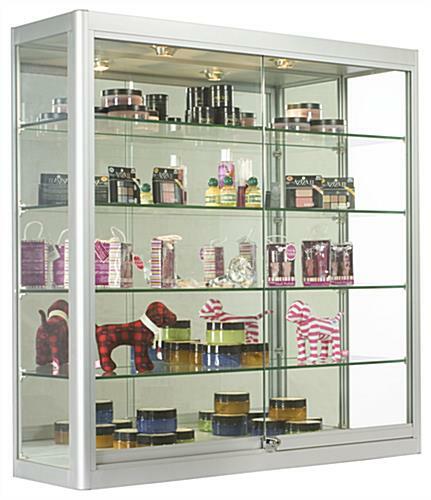 This jewelry showcase, also known as a display case, ships pre-assembled, with all hardware and Mounting Instructions included.